From Plex. Godzilla: Final Wars is the Destroy All Monsters of the new era series, produced to coincide with Godzilla's 50th Anniversary. Directed by Ryuhei Kitamura and written by Wataru Mimura and Isao Kiriyama, Godzilla: Final Wars features almost every Toho kaiju, along with a number of actors from previous Godzilla films who appeared as main characters or in cameo roles. When Godzilla: Final Wars had its premiere in Hollywood on November 29, 2004, Godzilla was given a star on Hollywood Walk of Fame! 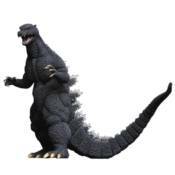 This 12' scale figure captures the final design for Toho's biggest star, in his final appearance (in a Japanese film).